They must have had screened porches in Edith Wharton’s day. 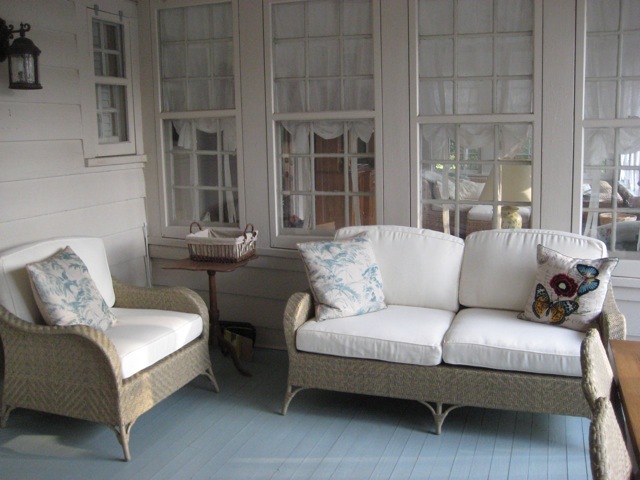 A quick Google search tells me that screened porches became particularly popular around 1880. And were still popular by the time Edith built The Mount. Yet, a screened porch wasn’t part of her plans. Maybe there were fewer mosquitoes up in the Berkshires in those years. Down here in the South, screened porches are considered an essential. They helped people survive scorching summers before air conditioning. A friend of mine tells me that as a child in South Carolina, her mother would move their entire lives out to their screened porch in the summer, including her sewing machine, so even in the blistering heat, she could work while her children played card games on the cool flagstone floor. 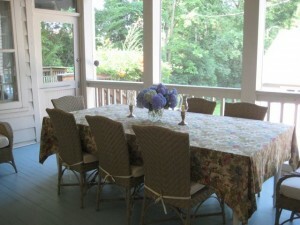 My mother always dreamed of building a screened porch but it never came to pass. In the 1960’s, my father bought her a eight foot round pop-up aluminum screen house they erected on the lawn. It was a poor, crowded substitute for her dream porch that blew over in every high wind. My mother was thrilled when we bought our 1930 house with its large, airy screened haven right off the kitchen. Her eyes lit with pleasure the first time we served her dinner out there. These days, we always eat dinner amidst the sound of crickets and waving trees when the weather allows, which it often does in the spring and fall and sometimes in the summer. The porch even makes a wonderful place to write. Its most magical use, however, comes when a night storm moves in. My husband and I cuddle out there in the dark whispering, watching the lightning , listening to the tattoo of rain on the roof, feeling cozy and very lucky. No, it’s from my house in Nashville where I live now. I moved down here full-time three years ago. Nice post Jennie, I can see you cuddled on the porch on a dark and stormy night feeling lucky! There are very few screened porches in Marin, because we have very few bugs here. Since it does not rain between June and September, except for an occasional mist from the fog dropping down over the mountain from the ocean and bay, the mosquitoes are all dead and gone by early summer. It does get a little cool in the evenings though, so you may need a light sweater. Talk about feeling lucky! You should try Marin. You will be able to swing it once your book hits the NY Times bestseller list, right? How do I get a copy, by the way? 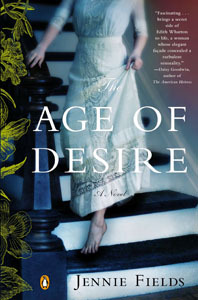 I want to have at least read it when I recommend it to my book club! Pat, you definitely live in paradise. No mosquitoes. I swoon at the thought. And it’s so beautiful there! The book will be in the stores August 6 (and really, probably a week sooner.) I’ll send you a message on FB. Glad my post brought up nice old memories. And nice to hear your mother has what my mother never got: a screened porch where she can read! My Grandmother had a “Summer House”, a small screened house in her backyard, where all the sons slept in the summertime to keep cool. It was torn down a few years ago, but I have a picture of it and a dream of having my own version some day. Why Edith Wharton? How Edith Wharton’s Letters Flew!